Your objective in the game is to restore 18 Inca artifacts by solving tricky puzzles as you travel through 90 increasingly challenging levels. Cross the equator and follow in the footsteps of the Incas to discover ancient artifacts. 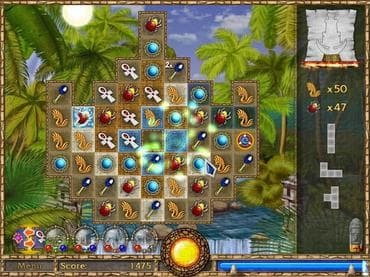 Learn the magic of the great Inca by solving tricky puzzles in exotic locations. Not your typical swap-and-match puzzle, this game lets you select an entire strip of tiles to match three or more of the same kind. Download free full version game and find the Treasures of the great Inca! If you have questions about Treasure Puzzle game, please contact us using this form.